God divided the Red Sea and opened up dry ground in the middle of the sea with the walls of water standing on each side. The people of Israel walked on the dry ground through the middle of the sea. 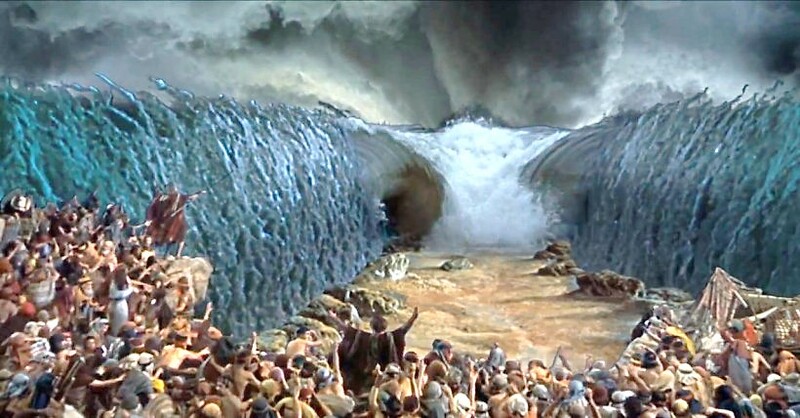 However, the Egyptian army chasing the people of Israel were all drowned in the Red sea when the massive walls of water returned to their place. All of the Israel people saw the mighty hand of God, and heard the thundering noise of the two walls of water while collapsing. The people of Israel experienced the God’s miraculous power that they would have never forget for their rest of their lives. They heard thundering sounds of the falling sea, and saw the gigantic waves created by the falling sea, which hurled the might Egyptian army into the deep sea. None of them left. None. All of the fears of the deadly Egyptian army were suddenly no more. 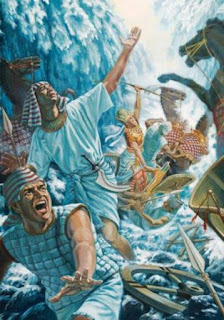 Yes, when they saw the deadly Egyptian army, they complained and argued against God at the other side of the Red Sea. 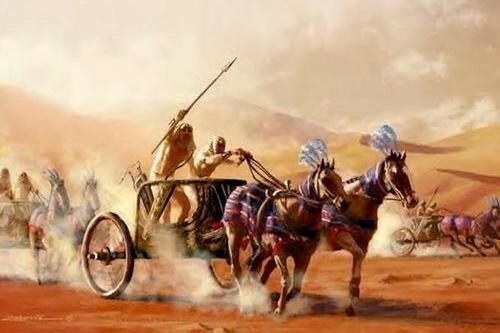 They did not know what God would and could do for them before the Egyptian chariots and horses quickly approaching. When the dire reality hit, they quickly gave up hope and the promise. Even so, God, who is merciful, delivered them with His mighty hand because He was faithful to His people – the people of Israel, as He promised to Abraham, their forefather. They witnessed the mighty God and His faithfulness with their own eyes. Then Moses led the people of Israel away from the Red Sea, and they moved out into the desert of Shur. They traveled in this desert for three days without finding any water. Their memory of the unforgettable experience on God’s mighty acts: making them walk on dry ground through the Red Sea while utterly destroying the mightily fearful Egyptian chariots and horses by drowning them into the death of the Red Sea, was fading away under the desert sun. They became thirsty. They looked around all directions, but they could not see any signs of water. Their hearts were fixated on how to quench their thirst. It was the third day in the desert. Walking three days without water was a torture, especially under the bone-dry desert sun. Soon one cried out, “I’m thirsty.” Soon, another followed, “I’m thirsty, too.” Then many of them spoke out their thirstiness. Not long before all heard the grumbling voices among them – “I’m thirsty.” They were all exhausted and thirsty, and no water was in sight. As they were getting out of the valley, they came to an open area. Then suddenly an oasis with trees was spotted! Their hearts were immediately relieved because they saw water. Their misery was immediately gone because they found an oasis. In joy and hope, some of them hurriedly ran into the oasis. They scooped up the water with their hands, and put in their dry mouths. Their mouth immediately rejected the water, because the water was so bitter that they, although they were literally dying for water after the last three days’ walk without water, could not shallow. Then the people complained and turned against Moses. “What are we going to drink?” they demanded. Yes, they complained. Again, this is a pity part of our human nature: we just react on what we see, touch, and feel rather than with faith in God while leaning on God’s hand, which is bigger and mightier than what we see, touch and feel. Moses, who was only one, who was faithful to God. He cried out to the LORD for help. God was merciful, and dearly patient to His people, the Israelites. Not because they were lovable, but because God loved the Israelites, God heard Moses’ cry. Then God showed Moses a piece of wood, and instructed him to throw into the water. Moses did it. This made the water good to drink. This was the mercy and love of God. God was dearly compassionate to His people, although His people was not faithful to God. Our merciful God gave them the fresh water by answering the prayer of Moses. One faithful prayer opened God’s mercy. All came drank and were fully satisfied. Yes, God was good, compassionate and dearly patient to His people. The same God watches over His people even now as you read. God instructed the Israelites how they should have behaved as a loving parent. God patiently explained consequences too. Why? They had failed already twice and most of all, God dearly loved the Israelites. The same God loves us. God is always faithful to us simply because we are His children. Yes, it is also true that God always tells us and instructs us about the consequences of our sins to guide us the paths of righteousness. Praise God, who dearly loves us and teaches us with His infinitely patience, mercy and love! God Is Our Refuge And Strength, A Very Present Help In Trouble! God divided the Red Sea and opened up dry ground in the middle of the sea with the walls of water standing on each side. 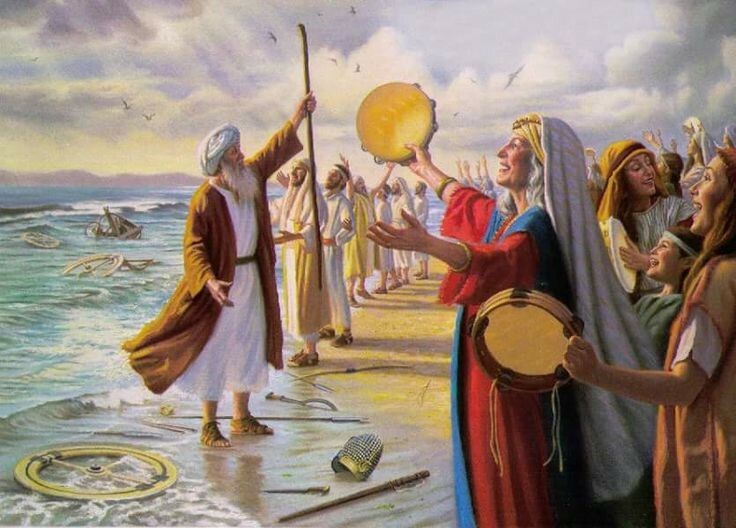 The people of Israel walked through the middle of the sea. Then the Egyptians—all of Pharaoh’s horses, chariots, and charioteers—chased them into the middle of the sea. But just before dawn the LORD looked down on the Egyptian army from the pillar of fire and cloud, and he threw their forces into total confusion. He twisted their chariot wheels, making their chariots difficult to drive. Their advance was severely delayed till the Israelites reached the other side of the Red Sea. 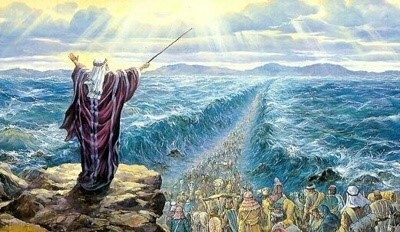 When all the Israelites had reached the other side, the LORD said to Moses, “Raise your hand over the sea again. Then the waters will rush back and cover the Egyptians and their chariots and charioteers.” So as the sun began to rise, Moses raised his hand over the sea, and the water rushed back into its usual place. The Egyptians tried to escape, but the LORD swept them into the sea. Then the waters returned and covered all the chariots and charioteers—the entire army of Pharaoh. Of all the Egyptians who had chased the Israelites into the sea, not a single one survived. That is how the LORD rescued Israel from the hand of the Egyptians that day. And the Israelites saw the bodies of the Egyptians washed up on the seashore. When the people of Israel saw the mighty power that the LORD had unleashed against the Egyptians, they were filled with awe before him. They put their faith in the LORD and in his servant Moses. Then Moses and the people of Israel sang to the LORD. Miriam the prophet, Aaron’s sister, took a tambourine and led all the women as they played their tambourines and danced. Just before this joy, they were chased by the mighty Egyptian army, and before them was there the Red Sea. They had no place to go. They were squared in between the mighty Egyptian army and the Red Sea, the insurmountable obstacle. They were about to be killed by the Egyptian army or to kill themselves by being drowned in the Red Sea. In either way, there was no hope but being killed. Upon confronting at this dire situation, the people complained to God and Moses, “Why you brought us out of Egypt. We could have been safely lived in Egypt although we were slaves.” For us, who know the end of the story, their humanly reaction was absurd or stupid. However, let’s think about what we would have done, if we put us in the dire situation without knowing what would come next. Would have we behaved really differently? Yes, the Israelites witnessed God, who brought them out with His miraculous deeds even killing all first born Egyptian sons including the Pharaoh’s first born son. They soon forgot His many mighty acts of kindness to them. Instead, they rebelled against God at the Red Sea. Even so, God saved them— to defend the honor of his name and to demonstrate his mighty power and faithfulness to His people. Yes, God is our strength and refuge in times of needs. God, who is merciful and full of love, is always with us not because we are always righteous before God or continuously faithful to God. God is love, and He is faithful to His children. Amen! He Loves Us Not Because We Are Lovable, But Because He Is Love! After tthe ten terrifying plagues, Pharaoh, the king of Egypt finally let the Israelites people go. When word reached the king of Egypt that the Israelites had actually left, Pharaoh and his officials changed their minds. “What have we done, letting all those Israelite slaves get away?” they asked. So Pharaoh harnessed his chariot and called up his troops. He took with him 600 of Egypt’s best chariots, along with the rest of the chariots of Egypt, each with its commander. 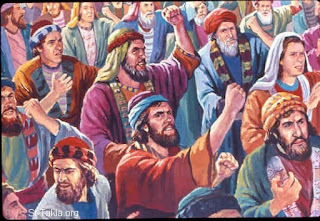 The LORD hardened the heart of Pharaoh, the king of Egypt, so he chased after the people of Israel, who had left with fists raised in defiance. The Egyptians chased after them with all the forces in Pharaoh’s army—all his horses and chariots, his charioteers, and his troops. The Egyptians caught up with the people of Israel. We are not much different from the Israelites. 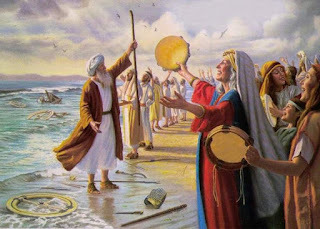 When even a slightest inconvenience comes into our lives, while following What God told us to do, our hearts becomes panicky, and our mouth starts complaining, even blaming against God like the Israelites, “Why did you bring us out here to die in the wilderness?” The Israelites saw the mighty ten plagues that had stricken those Egyptians who were against the God’s will, and witnessed the enormous tragedy coming upon the Egyptians including losing first born sons. Then they argued to God, “Why did you make us leave Egypt? We said, ‘Leave us alone! Let us be slaves to the Egyptians. It’s better to be a slave in Egypt than a corpse in the wilderness!’” Not only did they complained against what God did for them, but also did they not believe God although they had just eye-witnessed the might power that brought them out of the Egypt, and the faithfulness of God as promised to their forefathers. They quickly connected dots by their own way – one dot: Egyptian army was chasing us, and another dot: we would be killed by the Egyptian army. Such a quick thought was s at most absurd or even stupid. 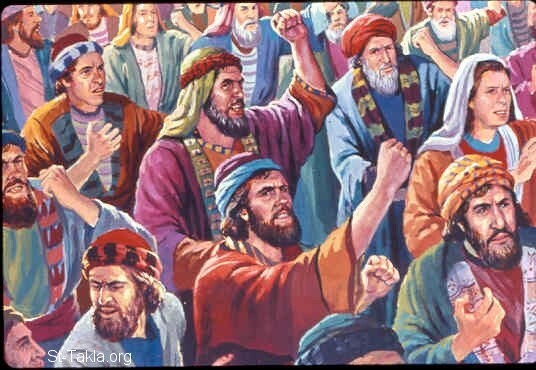 Who brought out the Israelites? God did. 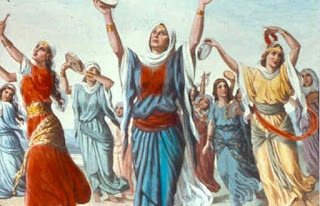 Who subdued the mighty Egyptians who slaved Israelites for four hundred years? God did. Now, they saw the same Egyptians chasing them. What would be the most logical conclusion? Would the same Egyptians kill the Israelites or would the Egyptians confront the same fate as God did before? Logically speaking, the answer was so obvious. The Egyptians would meet the same fate as before -- being defeated by God again. On the contrary, the entire Israelites were panicking and blaming God while expecting to be killed by the Egyptians, rather than seeing again the God’s mighty hand as He did before. 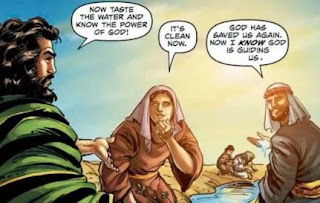 How illogical the Israelites were! Yes, the Israelites did not faith at all. How about us? What’s our reaction from our heart when we meet a difficulty while we follow God’s will? Do we remember God’s miracle and His power or are we panicky because we focus on the difficulty that we can see and touch while connecting dots with a worst scenario like the Israelites who imagined out the worst with their illogical and faithless heart – i.e., being killed by the Egyptians? God told to Moses to move the people toward the red sea, which was a complete impossibility or even insane. Then God asked to raise your hand over the sea to divide the water so the Israelites can walk through the middle of the sea on dry ground. Of course, Moses had divided any sea before to expose dry ground in the middle of the sea. If you were Moses, what would be your response? Moses faithfully did. He raised his hand over the sea, and the LORD opened up a path through the water with a strong east wind. The wind blew all that night, turning the seabed into dry land. So the people of Israel walked through the middle of the sea on dry ground, with walls of water on each side! It was a dark night. Jacob was alone at the bank of the Jabbok River. He was wrestling with an angel, who appeared to him while he was desperately praying to God. Suddenly, all of his past sins finally found him, and made him terrified. The weight of his sins and the fear from his past sins were hugely heavy that he could not cross the small Jabbok River. His home town, where he was born, was just the other side of the river, but he could not cross by himself. He prayed and prayed. Then an angel appeared to Jacob, while he was praying, and Jacob started wrestling with the angel. Jacob remained on one side of the river although all of his young children and all of his possessions were sent to the other side by crossing the river. (This is one of the best examples in Bible about the weight of sins committed by a person, which debilitates the person.) At the most crucial point of Jacob’s life, his past sins found him. Till that moment, all things of Jacob went well in earthly measures. He was successful. To achieve his success, he tricked Esau, his brother and Isaac, his father. He stole the blessings that Esau should have had received. As a result, He had to flee, but God protected him while he was fleeing. Jacob arrived at his uncle’s house, and lived there for twenty years. During his stay with his uncle, Laban, Jacob tricked his uncle and accumulated his wealth. Later, Laban’s family told, “Jacob has gained all his wealth at our father’s expense.” Jacob had to run again. Soon, Laban noticed Jacob fleeing from him, Laban pursued him, but God intervene Laban in a dream and told him, “I’m warning you—leave Jacob alone!” Thus, Jacob was saved again. By God’s help, all of his possessions were intact, and he could return to his birth place now as a wealthy man with twelve sons. When he left his home, he was alone and had nothing. His huge success in his life made him blind to his sins committed throughout his life. God, who saw through Jacob’s life, knew exactly that Jacob was not ready to cross the river. God knew Jacob had not been changed at all. He was clever and tricky to be successful on earth. God had been faithfully protecting Jacob and allowed him to be successful, not because he was righteous and/or better than others, but because God made the original promise to Abraham, his grandfather. God patiently waited the precise moment that could change Jacob to the person that God really wanted. That night was the exact moment – Jacob’s spirit was completely paralyzed by his past sins, and he could not do anything anymore. He prayed and prayed that night, because his sins were so heavy, and he was completely helpless. The gracious and merciful God sent an angel. Jacob tenaciously wrestled with him throughout the long night. When the angel saw that he would not win the match, he touched Jacob’s hip and wrenched it out of its socket. (Genesis 32:25b) Even so, Jacob did not release him. He was really persistent. The wrestling continue till dawn. 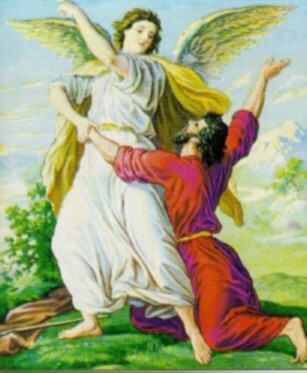 Jacob could not release the angel. He really needed God’s blessing. He clearly knew how sinful he was. He was completely helpless. Without God’s help, he could not make even one more step toward his home. Finally, out of the struggle with the angel, the old Jacob gave in, and released the control of Jacob. Jacob was freed from the old self. In fact, God waited and waited for this moment. God gave many opportunities for Jacob to see himself directly – how tricky and sinful he was. Jacob had not truly seen himself till the night. Now, the old self was completely drained out from Jacob. Jacob was ready. “Your name will no longer be Jacob,” the angel told him. “From now on you will be called Israel, because you have fought with God and with men and have won.” (Genesis 32:28) Then the angel blessed Israel, the new Jacob, and left. God, finally, carved out Israel, God’s masterpiece, from Jacob, the raw material. The name “Jacob” means “heel catcher”, who was zealous of everything from the birth. He grabbed his older twin brother’s heel when he was born. Since then, he was always greedy and tricky for his own gain. Indeed, Jacob, as the old Jacob, could not receive the promised given to Abraham. God had to change Jacob first before granting the promise. Jacob had to struggle to take off the old self. He fought for his own fear from his past sins. This fight was not easy. He had to wrestle with the angel throughout the night till dawn. The angel hit hard and added an excruciating pain by making his hip socket out. 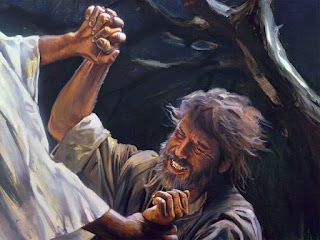 Although he was experiencing the unspeakable pain from his dislocated hip socket, he clang to God by holding tightly with the angel over the night. Of course, it was not a real match. It was a God’s grace and mercy. 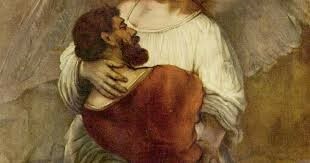 Although Jacob felt he was wrestling with the angel, but the angel actually hold him in his bosom. Jacob was not able to even stand upright by himself due to the dislocated hip socket, let alone wrestling against the angel. In the angel’s bosom, the old self was destroyed, and Israel, a new Jacob was born. The name “Israel” means “May God prevail” Yes, finally God prevailed in Jacob’s life by carving out Israel from the raw material of the old self. In God’s bosom, Israel was created, who later became the father of the twelve tribes of Israel people. Yes, this is the love of God, and His faithfulness to Jacob as well as toward us, who are still raw materials before God like the old Jacob. Praise God, who is always faithful to His children! Sing praises to God, who has no rotating shadow! Our God is the Ever-Loving Father, who will carves out from us, although we are rough and raw materials before Him, His masterpieces to do good works for God.